A roof is something many of us take for granted. It’s there, keeping the rain and snow off our heads. But there are times you should have a roofing consultant do a thorough review of your roof before problems become obvious. A professional, qualified roofing consultant is not cheap, but bringing one in before you need roofing work done can save you money in the long run. Here are some of the signals that tell you it’s time to call up a roofing consultant. Few people even look at their roof. But even a quick, cursory inspection can reveal impending problems. If your roof has obvious damage to shingles or whatever material it’s made of, it’s time to have a qualified professional do a complete inspection. Don’t wait for the leaks to start. Your roof should be straight and even. If you notice sagging slopes or ridges, or buckling areas, it could signal structural weakness or damage. Don’t delay calling a roofing consultant to evaluate what’s needed to repair the issue. 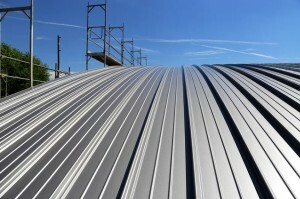 The whole roof should have an even, consistent appearance. One area that’s darker than the rest, or areas that appear dirty, could signal different issues. Darker areas could be a sign that the shingles are aging and wearing out. A roofing consultant will advise you to replace the roof before it starts to leak or failures become more serious. Dark or dirty areas could also be signs of moss growth, which should be removed before it leads to greater damage. Flashing is a metal layer — usually aluminum — covering the joints where the roofing material meets a chimney, wall, vent or other material. Damage or warping to the flashing can let water in under the roof. Take a look at your top-floor ceilings and, if you have one, your attic. Water stains or other obvious damage is a clear sign of a leak in the roof. You also may observe sagging roof deck from the inside, as well as dark spots. Stained, crusted or matted insulation is another sure sign of leakage or other problems. Sunlight shining into the attic is a sure sign of problems. If you observe any of those, or other signs of water or leakage, call in a roofing consultant to determine where the problems are, their extent and what to do to solve them. Gutters that overflow with either rain or ice are not functioning the way they’re meant to — taking water away from the building. Overflowing gutters can also deposit water near the foundations of the building, leading to more potential problems. If your costs for maintaining a comfortable temperature inside the building are rising, it could be a sign of either a leak in the roof or insufficient insulation in the attic. A roofing consultant can show you how to avoid costly problems before they become problems. They can see weaknesses in your roof’s structure and installation. They can also help you find qualified contractors to best address the problems, write the appropriate specification for repair or prevention, and list the skills and experience needed to achieve the objectives. And once the repair or mitigation is done, a roofing consultant can tell you whether the contractors did the job right. Don’t wait for problems to become obvious. Call a roofing consultant for a professional assessment of your roof’s condition and suggestions for preventing problems.